Active Adult – 55+ Neighborhoods in the Triangle. Until relatively recently there have been very few options for those looking for active adult (55+) communities in the Triangle Area. The first was Heritage Pines in Cary, which whilst it has numerous activities and great facilities, has a quiet homely feel about it. Next on the scene, started in about 2006, was Del Webb’s Carolina Preserve, again in Cary. Carolina Preserve has everything that those growing old gracefully (and some not so gracefully) could want. Impressive leisure and fitness facilities, social areas and clubs covering just about any interest you could imagine. 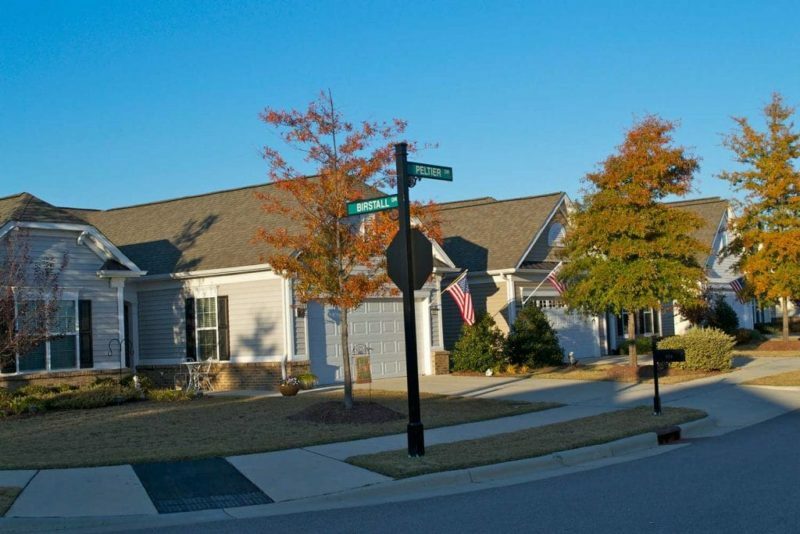 Del Webb followed up with Carolina Arbors, similar in every respect to Carolina Preserve. The ‘New Kids on the Block’ in terms of 55+ communities are AV Homes Creekside at Bethpage and the Sears Farm North ‘Active Adult Condos’ in Cary, part of Searstone. Durham. A Dell Webb Community. Cary. A Dell Webb Community. Part of the Searstone Community. These neighborhoods are not specifically designated as Active Adult (over 55) neighborhoods but may be suitable for those seeking a similar lifestyle.